Quality for us is the bar that we set ourselves time and time again with every text that needs to be translated, every time we come into contact with our clients and vendors, and with every internal process. The main force behind our day-to-day work is our drive to aim for excellent and outstanding quality standards and ultimately also be able to maintain these, to identify shortcomings in quality and to resolve these. This ranges from the goal of flawless translation quality and the quality standard of adherence to deadlines and reliability, right through to our pricing, with which we want to attract permanent clients on the market. In order to get a better hold of the variety of demands that are placed on us and that we place on ourselves, we follow the golden rule of customer satisfaction in everything we do. This means that with us, clients define what quality means for them and therefore also for us. This puts us in the position of being able to deal with challenges flexibly and of always being guided by the particular needs of our clients. By the same token, quality for us does not just mean the quality of products and processes – it also covers all aspects of the client relationship. Quality starts with attentiveness in meetings and joint agreements so that later on we can give our clients the service they really wanted. And it continues with us constantly improving our knowledge and understanding of our clients as we work together, which enables us to help them with optimising their internal translation management processes. 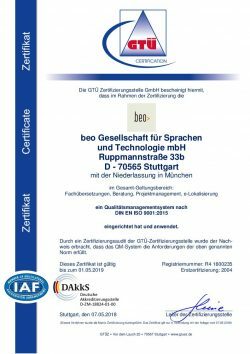 When it comes to certification in accordance with ISO 9001, it is not only compliance with the standard that is key for us – checking the functionality and efficiency of the quality management system is also particularly important, so that we retain the confidence that our clients place in us.